These bothersome, but otherwise harmless insects have been invading Minnesotan buildings for the last ten years. Native to eastern Asia, these beetles are used to a warm climate, and in fall flock to the side of warm buildings. From there, they crawl into small openings in your siding, roof, windows, or cracks, and live in your buildings for warmth. 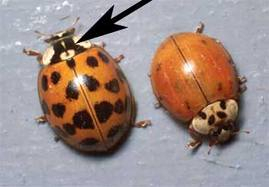 Luckily, these Asian Beetles are harmless. They carry no diseases, and the worst they can do is pinch you causing slight discomfort. Another relief is that they will not damage your property. Hiring a professional pest control service, such as Eco Tech, is your best bet in getting rid of these overwhelming bugs. They come in huge swarms, and no matter how many you get rid of, more keep coming! When hiring Eco Tech we guarantee to exterminate all these pests using our less toxic organic product line. To go along with our guarantee, we offer the industry’s leading warranty.